Anthony Riley appears on The Voice. 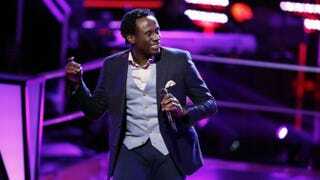 Anthony Riley, the Philadelphia-based street singer who rose to fame as a contestant on the most recent season of NBC’s The Voice, has died of an apparent suicide, reports the Philadelphia Inquirer. Riley, 28, a fan favorite who was being coached by Pharrell Williams, left the singing-competition show in January to deal with substance-abuse issues, the report says. But Riley took his life and was found Friday in the basement of the Center City apartment where he was staying, said Tootsie Iovine, a close friend of Riley’s, according to the news outlet. He had been working on an album but continued to struggle with addiction, his friends and family told the Inquirer Saturday. Riley had become a fixture in Philadelphia’s Center City, singing Motown and pop songs for tips on the busy commercial streets outside Reading Terminal Market, Penn’s Landing and Independence Hall, the report says. When Riley won an audition for Fox’s American Idol in 2010, he said street performing in Philadelphia helped toughen him up for the music business. Raised by his grandmother, Riley began singing at Suburban Station when he was 19 at the encouragement of his father, a conductor for the Southeastern Pennsylvania Transportation Authority, the report says. Halima Miley, Riley’s older sister, told the Inquirer that the family had yet to make arrangements but that a memorial would be open to the public. Read more at the Philadelphia Inquirer.